How to Print from a Chromebook: How does Google Cloud Print Work? 1. The first way is the easiest, but is only available to HP printer owners. If you own an HP printer, add this Chrome app from HP to your Chromebook, and you should be able to print to your printer wirelessly, or via USB. 2. HP so far is the only printer manufacturer to develop such a printing app. This means that if you don’t own an HP printer, you will need to utilize Google’s cloud printing service, called Google Cloud Print. Before we get started, it’s important to understand, that just because your printer says it is a “Wireless Printer” does not mean that it is Google Cloud Print capable. Google Cloud Print is a specific wireless solution that a printer manufacturer must choose to support. Look for the Google Cloud Print logo on the box. If your printer has this logo on the box, it is a Google Cloud Print Ready printer. If it does not have this logo, it does not support Google Cloud Print and is known as a “Classic” printer (these can still be set up to use Google Cloud Print. More on that later). Pretty much every major Printer manufacturer has a few Google Cloud Print ready models. HP, Samsung, Epson, Brother, Canon, Kodak, all these manufacturers have Google Cloud Print ready printers available. By far the best method for printing from your Chromebook is using a Google Cloud Print ready printer. 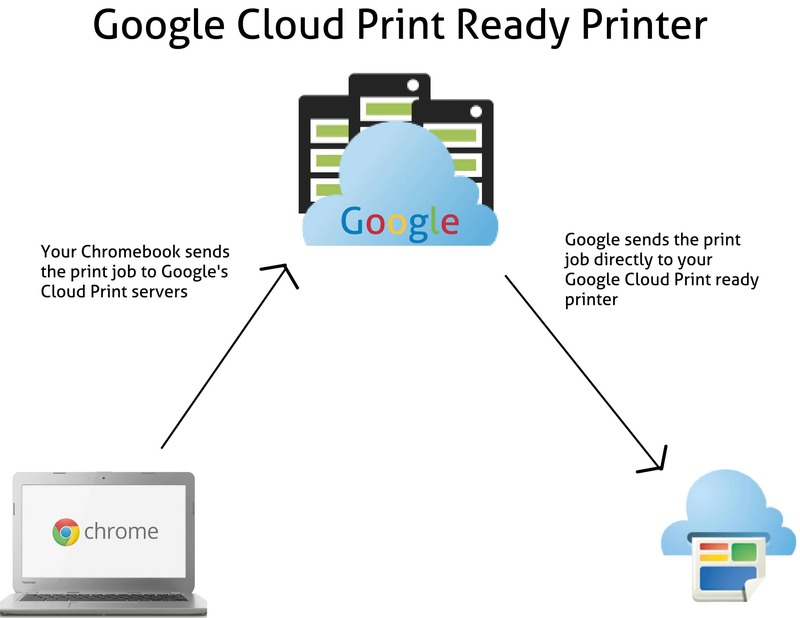 If your printer is a Google Cloud Print ready printer, (click here for a list of some known GCP ready printers) there are 3 parties involved in the printing process: your Chromebook, Google’s servers, and your printer. When you print a document, your Chromebook sends the print job to Google’s Cloud Print servers, and then Google sends the print job to your printer. You can see this is a little different from the typical method of printing, where the computer sends the print job directly to the printer. If your printer is turned off, or not connected to the internet, the print job will remain in your Google Cloud Print queue until the printer comes back online, then it will print automatically. If you have a Classic printer, you can still print to it from your Chromebook using Google Cloud Print. But since your printer does not support Google Cloud Print, and is therefore unable to connect to Google’s Cloud Print server on its own, you will need another computer that can connect to Google’s Cloud Print servers on your printer’s behalf. 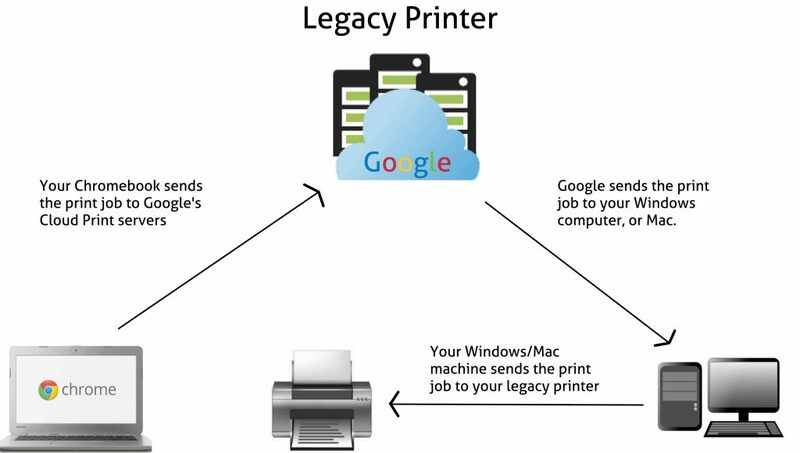 If your printer is not a Google Cloud Print ready printer, (classic printer) there are 4 parties involved when printing, instead of 3: your Chromebook, Google’s servers, a Windows PC or Mac, and your printer. The Windows/Mac machine is communicating with Google’s Cloud Print servers on your printer’s behalf, since your printer is not capable of doing it on it’s own. In this case, your Chromebook sends the print job to Google’s Cloud Print servers, Google then sends the print job to your Windows/Mac machine, which sends it to your printer. If your Windows/Mac machine, or your printer are offline, the print job will remain in your GCP queue until the printer/Windows/Mac machine comes back online, then it will print automatically. Now that we know how Google Cloud Print works, let’s talk about setting up your printer. Printing from a Chromebook is a little different than printing from other computers. This guide shows you how. I appreciate your trying to provide assistance, which is probably excellent for those technically inclined (and more patient). However, my attempt to print from a Chromebook was an abject failure. Fortunately, I was able to return the HP printer and get a refund. My understanding is that this is not a problem exclusive to HP printers. if I ever decide the ability to print is essential, I will ditch the Chromebook and replace it with something that is printer friendly. Ive a Toshiba Chromebook which I link to my HP Envy4500 series printer via a usb cable. I have the exact same problem as Nick L. I have an Asus Chromebook C300. I bought a wireless Canon PIXMA MG3600 printer (on recommendation from PC World, as everything was supposed to be cloud ready!). I couldn’t get it to connect wirelessly. Was left in a bit of a hurry after spending HOURS of trying to get it to work. Eventually had to run into PC World and buy a USB cable to get it to talk to my C300. Located what I wanted to print in my docs folder, checked in print preview that it looked ok and it prints it out 4 inches x 3 inches on an A4 sheet of paper. Could someone tell me how to solve this ‘expensive’ problem? Would be much obliged.